While traveling in Spain in 2015, I ordered many versions of gazpacho, and while some were better than others, none were made with watermelon. When I saw this recipe in Fine Cooking, I was intrigued. 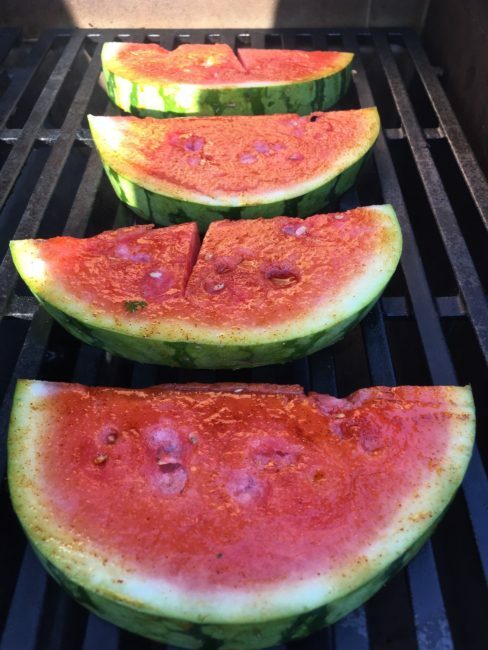 Recently we fired up the BBQ and grilled up some watermelon. 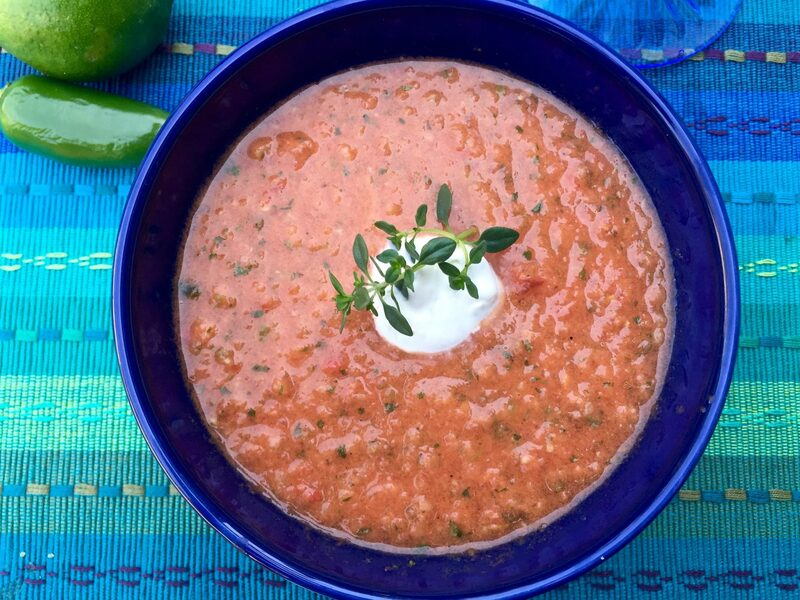 The results were delicious, and Tom has declared it his new favorite summer soup (which is amazing as he claims to hate cucumbers!). 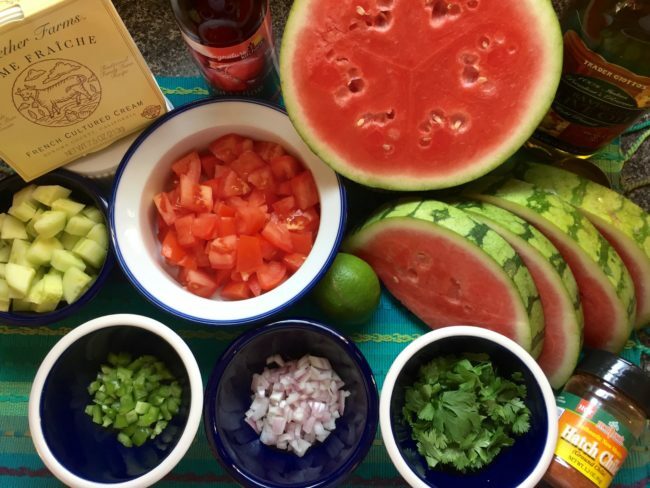 After following the original directions, I had leftover watermelon and cucumber, but no actual gazpacho left over, so I have increased the ingredients a tad to yield more servings. With regard to the watermelon, if you haven’t tried Dulcinea brand, we really like them. Small, flavorful and seedless. Heat the grill to high. In a small bowl, combine 2 T. olive oil with the chile powder (add more chile powder if you like it spicier). 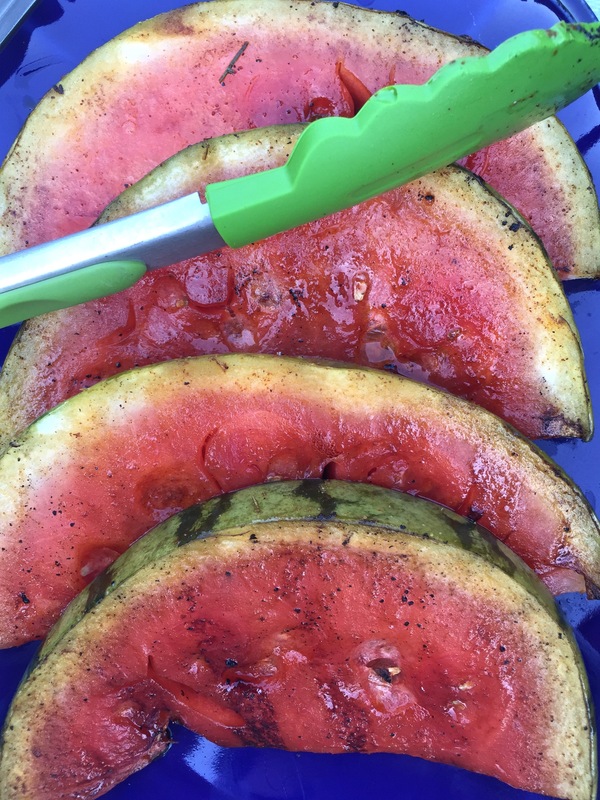 Brush the watermelon slices with the chile oil and sprinkle with salt. Grill the watermelon slices until nicely charred on both sides (about 2 minutes per side). Transfer to a cutting board. When cooled, remove the rind, seed if necessary, and coarsely chop the flesh. In a blender, combine the watermelon flesh, tomatoes, cucumber, cilantro, shallot, Serrano chiles and 1 1/2 T. olive oil. Blend until almost smooth. Transfer to a medium bowl and stir in the freshly squeezed lime juice and the red wine vinegar. Season to taste with Kosher salt or, my favorite, fleur de sel. Refrigerate until thoroughly chilled, about 4 hours. Lime Crema Garnish: Combine the crème Fraiche with the lime zest in a small bowl. Thin with a small amount of water or lime juice if necessary. 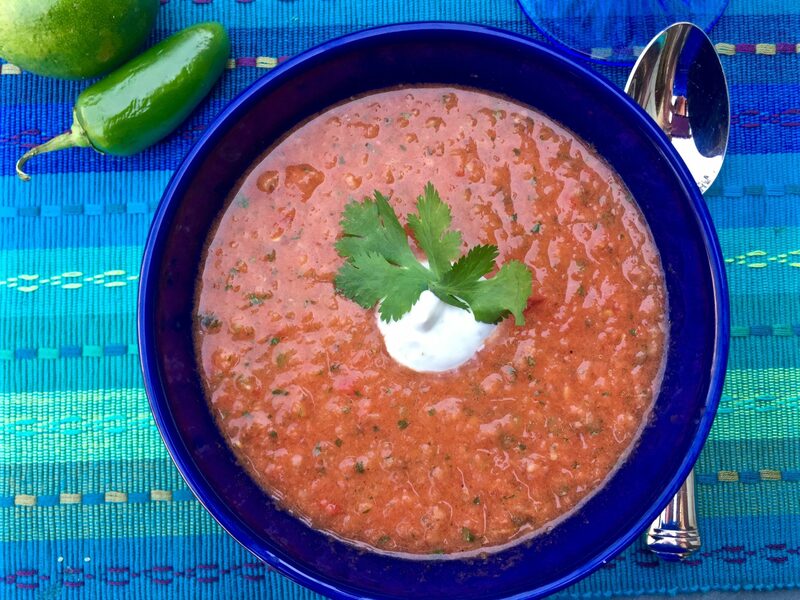 Add a dollop over the soup when serving. 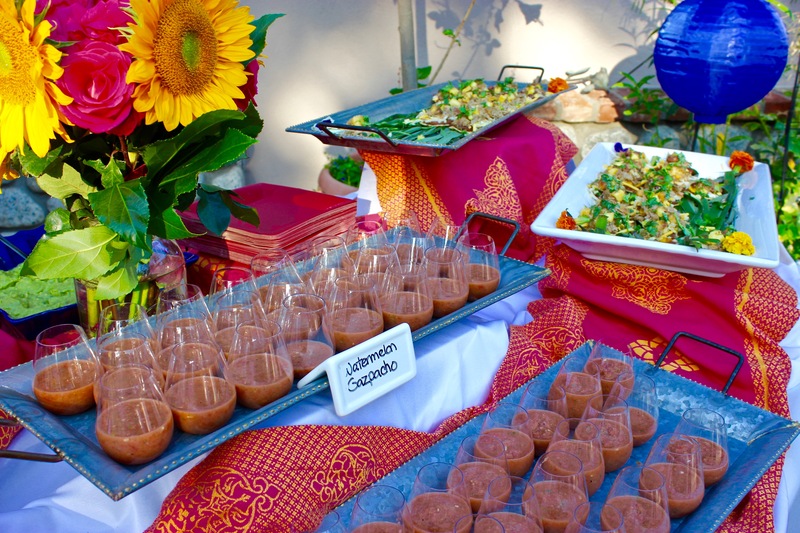 For dinner parties (or a large party like this one we had for Tom and his friends who are celebrating their 65th birthdays this year), I put the soup in small glasses and serve it as Gazpacho shots.